When you go into a drug and alcohol treatment plan, you are making a commitment to yourself that you will change no matter what. This change cannot just be swearing off alcohol or drugs; that much is a given. In order to succeed at the drug and alcohol treatment plan, you must change your life. That means you need to really consider who your friends are. You need to only hang out with those who will not tempt you to do drugs or drink alcohol. That means you’ve got to make some hard choices and you may have to say goodbye to a certain number of friends. You must refrain from visiting locations that may tempt you or that may bring up feelings of sadness or bring on stress that may cause you to relapse. That means staying out of bars, restaurants that serve alcohol (at least for a while) and refraining from any houses or buildings where you’ve engaged in drinking and/or drugs in the past. This is probably the hardest part of the entire drug and alcohol treatment plan. 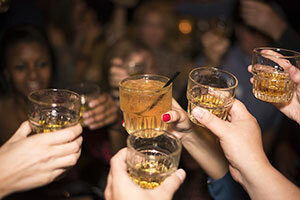 People who engage in excessive drinking and taking drugs often have a partner in crime or a group of friends they regularly engage in this behavior with. These are the ones you have to cut from your life. You cannot just say you’re going to refrain from taking drugs or from drinking, and keep these people in your life. You may not think it will ever happen but sooner or later, this person is going to discuss with you his or her outings where drinking or drugs were involved. Or, he or she may invite you out without thinking. Or, you’ll have a bad day or that person will, and the temptation to go and ‘forget it all’ will be very great. For these reasons, and any other situations that cause you to question why you’re going through the drug and alcohol treatment plan in the first place, you need to cut these people from your life and you either need to find new friends or you need to reacquaint yourself with your previous friends you probably stopped hanging out with to engage in the lifestyle that got you into trouble. Whether your treatment is an outpatient drug and alcohol treatment program, or it’s inpatient, eventually you’re going to be on the outside and you’ll find yourself facing a situation that might tempt you into using again. These may include restaurants, bars, watching movies that glamorize drinking or using drugs, parties, barbeques, and any other place or situation that has anything to do with drinking, drugs or a combination of both. You have to avoid these places and situations. Do something else entirely. If you offend someone, or someone becomes upset because you’re bailing on them or you decline their invitation to join, you don’t need those people in your life anyway and you’ll better succeed at your drug and alcohol treatment plan by cutting them out of your life entirely.